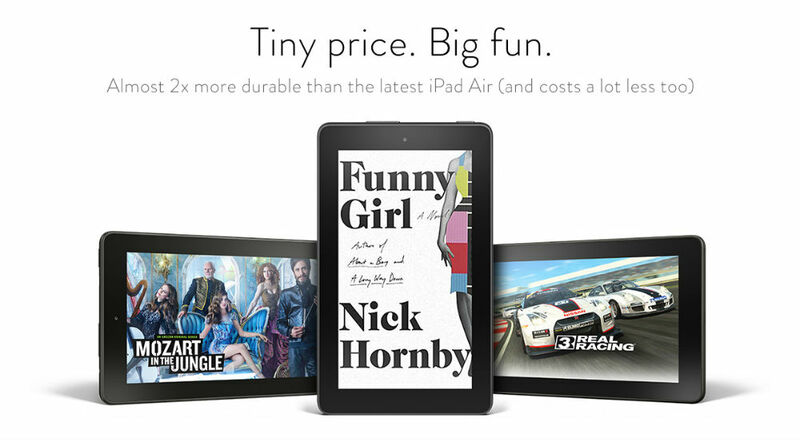 This morning, Amazon announced a new lineup of tablet devices, all set to release at the end of the month. First up, we have the Fire, a $50 tablet that features specs any budget-minded consumer can get behind. The Fire features a 7″ IPS display (1024 x 600), quad-core processor, front and back-facing camera, microSD slot for up to 128GB of storage, access to Amazon Underground, plus a redesigned interface called Bellini. The Fire can be purchased as a single device, priced at $50 (pre-order starts today), or you can choose to purchase a 6-pack of Fire tablets for under $250. Yeah, you can buy Amazon tablets in bulk now. For those in need of a bit more computing power, you can pre-order the all-new Fire HD, coming in both an 8″ and 10.1″ model. Each features a quad-core processor, HD display, expandable storage slots for up to 128GB, access to cloud storage, front and back-facing cameras, and an incredibly thin design. The 8″ model is priced at just $149, while the 10.1″ model is $229.99. Lastly, we have the all-new Fire Kids Edition. This tablet is specifically designed for the kids in our lives, featuring a sturdy build, preventing the little ones from dropping and breaking it. It also features an IPS display, expandable storage, plus access to Amazon’s complete library of kid-friendly applications. Another perk is Amazon’s “worry-free guarantee,” where Amazon will replace the tablet, no questions asked, for two years if needed. Priced at $99, that’s a solid deal. For additional info, or to pre-order these devices, follow the links below.